Monica Lewinsky embraces U.S. President Bill Clinton at a Democratic fundraiser in Washington in October 1996. Lewinsky, the White House intern who had a sexual relationship with Clinton during his time in office, has finally broken her silence on the affair in a Vanity Fair article. Lewinsky sits in a car after meeting with her lawyers in 1998. 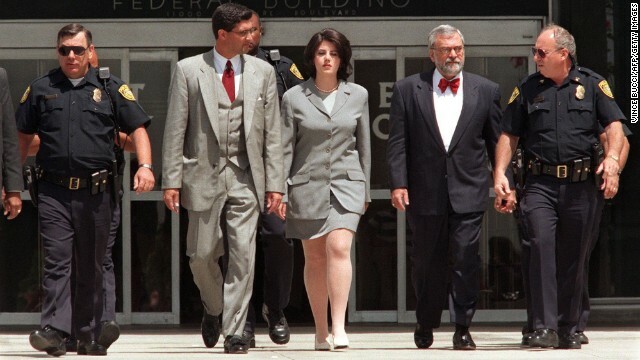 Lewinsky is escorted by police officers, federal investigators and attorney William Ginsburg, second right, as she leaves the Federal Building in Westwood, California, in 1998. She was there submitting evidence on her relationship with Clinton, who was impeached by the House of Representatives on charges of perjury and obstruction of justice. He was later acquitted. 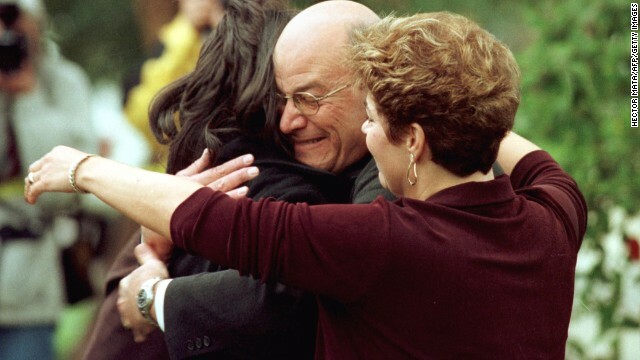 Lewinsky's father, Bernard, hugs her in front of his home in Brentwood, California, in 1998. In 1998, Lewinsky arrives at her attorney's office in Washington, where her immunity agreement with independent counsel Kenneth Starr was announced. 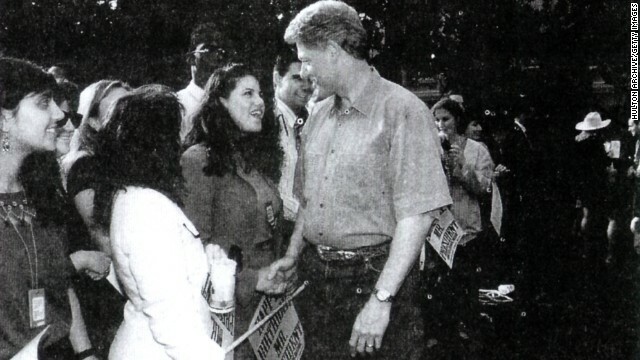 Lewinsky poses for a photo with President Clinton in this image submitted as evidence by Starr's investigation and released by the House Judiciary Committee in September 1998. 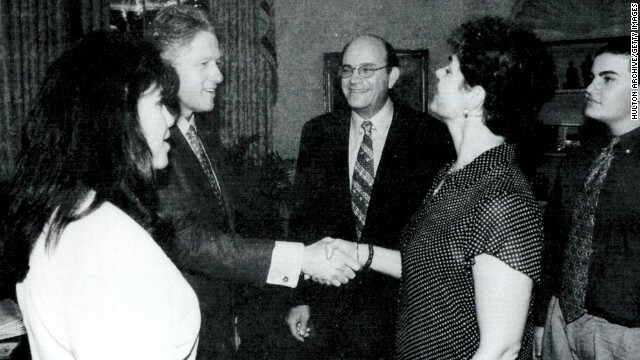 Another image submitted as evidence in September 1998 shows Lewinsky meeting President Clinton at a White House function. 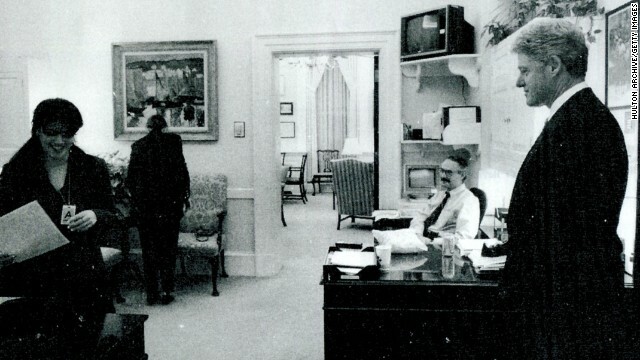 Another photograph submitted as evidence shows Lewinsky working in the White House office as President Clinton looks on. Lewinsky, far left, is seen with President Clinton at the White House. 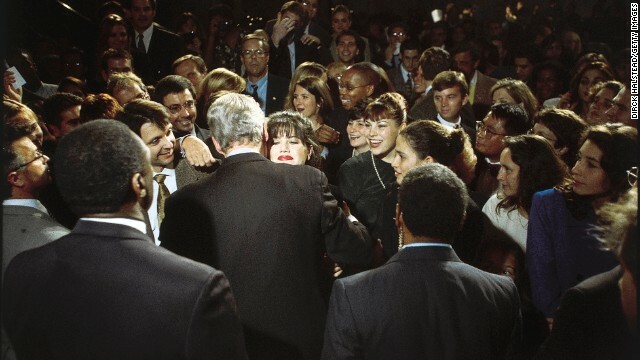 Lewinsky is pushed in a crowd of reporters after meetings with her attorneys in Washington in 1999. Lewinsky speaks with young fans as she signs copies of her autobiography, "Monica's Story," in 1999. 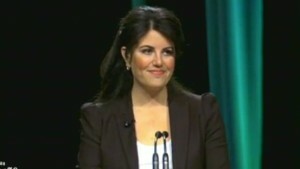 Lewinsky gestures during her deposition in a video shown during Clinton's impeachment trial in 1999. Lewinsky appears in a "Ladies Man" skit with Tim Meadows on "Saturday Night Live" in 1999. 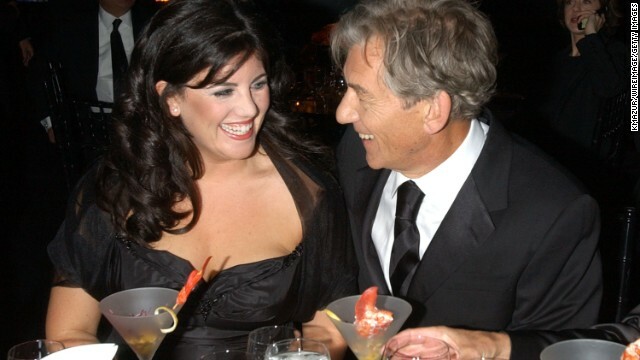 Lewinsky laughs with actor Ian McKellen at the 2002 GQ Men of the Year Awards in New York City. 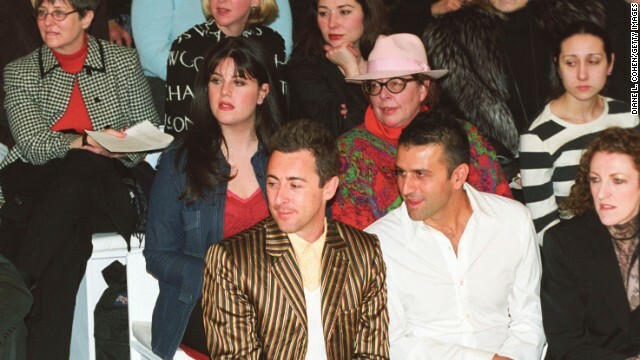 Lewinsky watches a collection presentation during the 2002 Mercedes-Benz Fashion Week in New York City. 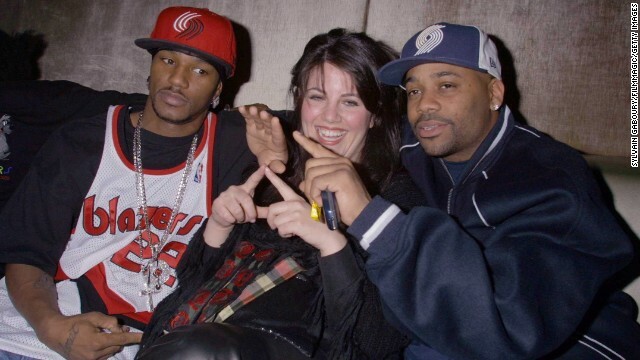 Lewinsky poses for a photo with rapper Cam'ron, left, and businessman Damon Dash in 2002. Lewinsky and literary agent Luke Janklow attend a benefit for the American Cancer Society in 2011. (CNN) -- Shameless. There's no other word to describe Monica Lewinsky. Sixteen years after her affair with President Bill Clinton became public knowledge, she's returned to the limelight with a campaign against cyberbullying -- of which she claims to have been "patient zero." Ignore the fact that she was patently not the primary victim in the Zippergate affair (poor Hillary Clinton was) or that any comparison with someone suffering a disease, especially at a time when people are dropping dead from Ebola, is tasteless in the extreme. What's most depressing is that when she rejoined the public stage, she said she was inspired to speak out by the story of Tyler Clementi, a student who committed suicide after a video of him kissing another boy went up online. Young Clementi was the victim of societal homophobia as well as an invasion of his privacy, and his death makes any comparison with Lewinsky's self-imposed troubles ridiculous. Moreover, Clementi died in 2010. Lewinsky has decided to revisit his cause in 2014, suggesting that the timing may have less to do with him than it does with Hillary Clinton. And, of course, this will be embarrassing for Hillary Clinton. 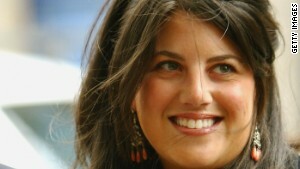 Lewinsky has joined Twitter, which will allow her to make uncensored remarks in the course of the 2016 campaign. And Lewinsky has also lashed out at the way the White House machine trashed her in its desire to protect Bill Clinton's reputation (as it was paid to do -- she had an affair with the President of the United States, not an anonymous bank manager no one gave a damn about). All of which will give ammunition to Hillary Clinton's critics on both the right and left. The right won't have to waste its own resources reminding people of the seedier side of the Clinton years -- Lewinsky can do that now. And Democratic opponents to the left of Hillary Clinton will rejoice that someone is perpetuating the narrative that the Clintons are gangsters who toy with the lives of others. Lewinsky's new cyberbullying angle is inspired: A significant number of Hollywood liberals must live in terror of unflattering/undressed photos of them getting out online. But while Lewinsky grabs some TV time talking about her own liberties, she forgets those of her fellow sisters -- the mistreated wives. Imagine that your husband was caught cheating and the contents of your marriage were discussed every night on television. Would you feel happy about his mistress reappearing 16 years later to drag the whole thing up again, and even to play the victim? Does Hillary Clinton not have a right to put this scandal behind her and have a political identity separate from her husband's? Lewinsky says that she wants to take on the "shame game." But what she did all those years ago and what she's doing now makes her a perfect candidate for a good, old-fashioned shaming.